Jeff's Landscaping & Yard Service, L.L.C. Before coming to terms with his love of the natural world, Jeff Barter pursued careers in retail, and later, advertising. While he liked owning his own business, he wished for a career that led him outdoors. After arriving in Prescott, Jeff worked for a short time with a prominent gardening store. He found he liked the work very much but, once again, wished to own his own business. Jeff's Landscaping & Yard Service was founded in 1992. Today, the company is owned and is managed by Jeff. Your communication with the company-- your call, your email, and your contact will be with Jeff Barter. When starting out, the business included Jeff, his one truck and a few quality tools. He was fortunate, early on, to be hired by devoted customers. Jeff takes great pride in having several of those customers with him still. Today Jeff finds it necessary to maintain a commercial storage site for his vast array of vehicles and equipment. This inventory of machinery allows Jeff's Landscaping & Yard Service to stand out from other local landscaping companies by providing a wide variety of services. Jeff also avoids machinery rental fees, and thereby saves his customers money and time. Jeff, now, has provided professional residential and commercial landscaping in the Yavapai region for more than 15 years. 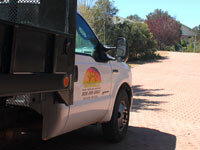 He and his crew endeavor to create landscaping solutions with courteous, cost effective and dedicated work. In Jeff's words: My goal is to establish and maintain a long-standing, personal partnership with my staff and our clients. We pride ourselves in delivering the artistic details of landscape design as well as mannerly concepts of promptness and friendliness. Jeffs greatest love is that of raising his two young boys who attend school in Prescott. The recent arrival of his mother has, in Jeff's words, "Added a family quality to our lives". Passionate in all facets of his life, Jeff dreams of expanding his culinary skills at home to a restaurant in Prescott. When he isn't working, or spending time with family, Jeff enjoys a ride on Yavapai scenic roads on his Harley Davidson. Contact us to receive an estimate for your landscaping project.